This is the beginning stage of a fire. It occurs when heat, oxygen, and a fuel source combine and have a chemical reaction resulting at the beginning of a fire. This stage is also known as “ignition.” Actually, most house fires that are started never even make it past this phase. Your best chance of stopping the fire from causing any damage or harm is to suppress it at this point. The potency of the growth is phase is determined by the amount and quality of the fuel the fire has to feed on. This can be determined by many other sub-factors. For example, the part or your home in which the fire started will have a significant impact. If it starts near wood as opposed to plastic or tile it will be much more dangerous. Furthermore, the danger of the fire can be dramatically increased if it starts near any combustible items which could cause explosions or flares in the fire. A few of these common household combustible items are aerosols such as hairspray, nail polish and nail polish remover, alcohol in any form, and many items in your garage. Your garage, especially, has the potential to be very dangerous. Chemicals such as motor oil, antifreeze, pesticides, paints, lighter fluid, and wood finishing just to name a few. This is the shortest phase of a fire and theoretically only lasts a moment, but essentially it is the part of the fire when all combustible materials have been ignited. It is the hottest and most dangerous phase of a fire. While the fully developed phase is the shortest part of a fire, the decay phase is by far the longest. It includes every part of a fire once the fully developed phase has passed. It is characterized by a significant decrease in oxygen and fuel which eventually leads to the end of the fire. Two common dangers during this stage are first – the existence of non-flaming combustibles, which can potentially start a new fire if not fully extinguished. Second, there is the danger of a backdraft when oxygen is reintroduced to a volatile, confined space. Our hope at JNT Restoration in Escondido is that the information above is never anything more than interesting for you in theory, not helpful in practice. 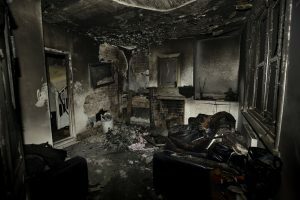 Nonetheless, if you do find your home devasted by the effects of fire damage our certified technicians at JNT Restoration are here to help you throughout the fire damage restoration process. With 24/7 emergency response and restoration service, the fulfillment of your fire damage restoration needs is just a call away!